On Wednesday, CWA President Chris Shelton joined 15,000 Healthcare, Research, and Technical professionals at University of California represented by UPTE-CWA Local 9119 on the picket lines at a rally during their strike in solidarity with the AFSCME Patient Care Unit's struggle for a fair contract. UC recently announced the insulting terms it is imposing on Patient Care Technical workers including increases to healthcare premiums and flat wages that don't even keep up with inflation. The workers are protesting the outsourcing of jobs that threatens safe staffing, patient care, and workplace safety. UPTE-CWA members are ready to make sure that UC serves the interests of students, workers, patients, and the community, not just Chancellors, CEOs, and Regents. "We're here today because of one thing and one thing alone: greed," said Shelton. "The greed of the CEOs and the administration and the higher management that works for UC." Shelton emphasized that 700,000 CWA members are standing in solidarity with UC workers, and called for a UC for the many – not the few. 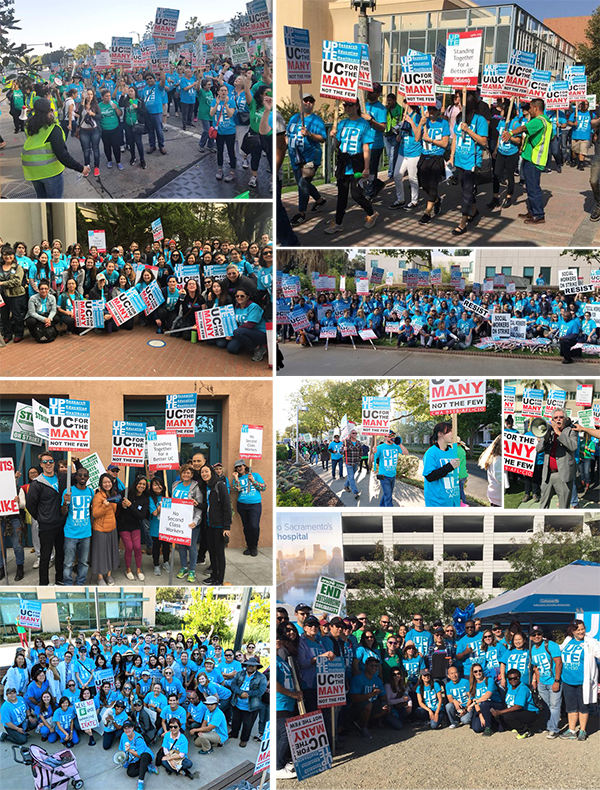 "UC claims to care about its patients and its employees, but turns around and imposes cuts on the AFSCME workers who are directly responsible for quality patient care," said UPTE President Jamie McDole, a Case Manager at UC Davis Medical Center. "This will only erode care quality, and UPTE members are not going to stand by and let UC get away with that." The joint CWA District 1 and District 2-13 Bargaining Committee reached a Tentative Agreement with Dex Media, Inc., covering 180 workers. The new two-year agreement contains base wage improvements and strengthened job protections, and successfully pushed back the company in several key areas where it was seeking cuts. After nearly five months of negotiations between the CWA bargaining committee and Nokia, the company has not backed down on its proposal to eliminate its union workforce, and has threatened to pull a proposal to extend retiree healthcare for two additional years. Nokia continues to turn a blind eye to the concerns expressed by CWA members regarding its customers' network security, poor quality and ability to compete in the future without the value added knowledge, and expertise of the bargaining unit's Installers. Nokia wants to move the work to a third-party service provider model that will cause hundreds of U.S. workers to lose their jobs. Future work would be subcontracted and, in some cases, outsourced overseas. The bargaining committee is asking members and retirees to continue to spread the word encouraging as many people as possible to send an online letter to Nokia CEO Rajeev Suri and Nokia Bargaining Chair Steve Muscat, urging Nokia not to eliminate American jobs and benefits, to bargain in good faith with the union for a fair deal that allows Nokia to invest in the U.S., to keep its long-standing installation workforce, and to maintain the quality of service and secure telecommunications infrastructure for U.S. customers. Editorial staff at Law360 including reporters and editors, members of NewsGuild of New York-CWA, voted overwhelmingly Tuesday to authorize a strike after two years at the bargaining table and no contract to show for it. The vote allows union leaders at the LexisNexis-owned legal news site to call for a strike if management does not promptly make significant movement in negotiations toward finalizing a strong, first contract. "We don't want to strike," said Juan Carlos Rodriguez, bargaining committee chair for Law360. "But, after two years, we're done with management dragging out these negotiations. This vote demonstrates that our newsroom stands united and is committed to securing a great contract, no matter what it takes." As part of their "Promises Broken" pickup tour, Good Jobs Nation held events in Bloomington, Ind., on Saturday with Senator Bernie Sanders featuring CWAers at AT&T who are fighting back against the offshoring of U.S. jobs. The pickup tour's goal is to raise public awareness of how, despite his campaign promises, the offshoring of American jobs by U.S. corporations has increased to record levels on President Trump's watch. 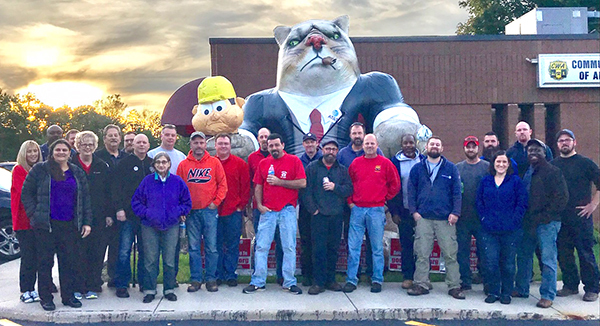 CWA Local 4302 members at AT&T Midwest in Akron, Ohio, are mobilizing for a fair contract! 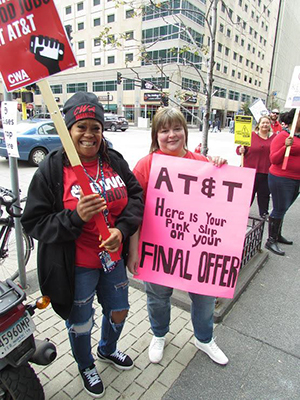 Members of CWA Locals 7200 and 7250 in Minneapolis, Minn., are holding weekly Thursday informational pickets to raise awareness of their fight for a fair contract at AT&T Legacy T! On Wednesday, CWA passenger service agents from American Airlines subsidiary Envoy Air rallied at Chicago O'Hare International Airport for sustainable, family supporting wages, as many of them are forced to rely on public assistance to make ends meet. The workers, joined by other airport employees, union leaders, and community supporters including Alderman Carlos Ramirez Rosa, Executive Director of Arise Chicago Rev. CJ Hawkings, and Secretary-Treasurer of the Chicago Federation of Labor Don Vilar, talked with travelers about their concerns and asked for their support in standing up to American Airlines as agents try to negotiate a contract with fair wages and better working conditions. In September, CWA conducted surveys of its members at O'Hare to document issues workers have reported related to mandatory shift extensions and other scheduling concerns, finding that 93% of Envoy agents report that they were notified of last minute shift extensions more than once per month. Mandatory extensions require workers to quickly find last minute child care, cancel doctor's visit,s and risk losing other employment. As the Chicago City Council considers a fair scheduling ordinance, Envoy agents also drew attention to the negative effects of American Airlines' scheduling practices. "It takes away time that I had dedicated to spending with my loved ones and it puts a strain on my relationships," said an O'Hare agent. "Throws you off completely. You get less sleep. You're more tired when you leave work and it's dangerous because a lot of us work [our second jobs] far from the airport and we are falling asleep behind the wheel," said another O'Hare worker. The next bargaining dates are November 5-6. CWAers from Locals 3204 and 3205 have been phone banking on Tuesdays to elect CWA-endorsed gubernatorial candidate Stacey Abrams, a strong advocate for working families. CWA activists from locals across Pennsylvania came together for a Political Activist Training in Hershey this week! The training was packed with political education and skill building on how to elect strong pro-worker candidates across Pennsylvania this November and beyond. CWA retirees across the country have been working hard to get out the vote for pro-worker candidates. 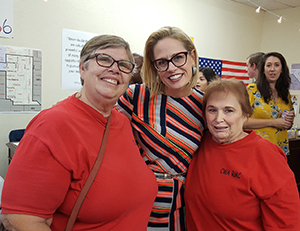 Members of the CWA Arizona Retired Members Council have been phone banking to help re-elect Congresswoman Kyrsten Sinema and elect David Garcia for Governor. CWA Local 1037 members knocked doors to talk to fellow union members about the need to elect pro-worker congressional candidates. CWAers knocked doors for Tom Malinowski in the 7th District and Mikie Sherrill in the 11th District. 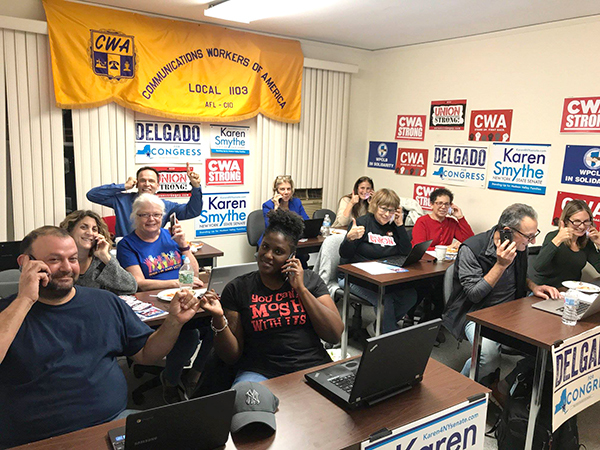 CWAers from Local 1103 are going all out to help elect pro-worker candidates like Antonio Delgado and Karen Smythe for State Senate! IUE-CWA has awarded 17 partial college scholarships for the 2018-2019 academic year. IUE-CWA members' children and grandchildren, including those of retired or deceased members, were eligible for the awards. Applications for the 2019-20 academic year will open on November 1. For more information visit https://www.iue-cwa.org/scholarships. Aurora Easton, father is Joseph Nguyen, IUE-CWA Local 84913. Attending Indiana University. Samantha Lincoln, father is Jeff Lincoln, IUE-CWA Local 83761. Attending Georgetown College. Wyatt Miller, father is Roger Miller, IUE-CWA Local 84802. Attending Purdue University. Trevor Szelis, father is Trent Szelis, IUE-CWA Local 84802. Attending Trine University. Bridget Fitz-James, father is Robert Fitz-James, IUE-CWA Local 81301. Attending University at Buffalo. Ryan Toles, father is Robert Toles, IUE-CWA Local 84729. Attending Marshall University. Brianna Colbert, father is Steven Colbert, IUE-CWA Local 88648. Attending Indiana University of Pennsylvania. Kayla Riegle, father is Isaac Riegle, IUE-CWA Local 84725. Attending Wright State University. Sophie Johnson, father is Paul Johnson, IUE-CWA Local 81301. Attending Roberts Wesleyan College. Kevin Walker, mother is Colleen Walker, IUE-CWA Local 88177. Attending Penn State Hazleton. Robert Hargenrater, father is Carl Watson, IUE-CWA Local 84555. Attending Washtenaw Community College. Lauren Rachetta, father is Michael Rachetta, IUE-CWA Local 81320. Attending St. John’s University. Casey Vollmer, father is Aaron Vollmer, IUE-CWA Local 88612. Attending Gannon University. Katelyn Klonowski, father is David Klonowski, IUE-CWA Local 86004. Attending Newman University. Christy Lyons, father is Christopher Lyons, IUE-CWA Local 83761. Attending Spalding University. Gabrielle Lucas, father is Walter Lucas, IUE-CWA Local 88648. Attending Westminster College. Eric Wilson, father is Chris Wilson, IUE-CWA Local 84717. Attending Youngstown State University. Democratic Senators on the Joint Economic Committee released a report this week showing that 15.4 million U.S. jobs – including call center jobs – are at risk of being offshored – a trend that's being made worse by provisions in the Republican corporate tax cut bill that took effect this year. "We've known that wages are stagnant and economic inequality is growing, but the Republican tax law gives massive tax breaks to the wealthy and corporations without the raises that working Americans were promised," said Sen. Martin Heinrich (D-N.M.), Ranking Member of the Joint Economic Committee. The report, "GOP Tax Law Risks Shipping American Jobs Overseas," includes original analysis on how many jobs are at risk for offshoring by state and industry. In states like Michigan and Wisconsin, nearly 16 percent of the private sector workforce may be threatened by shipping jobs overseas. CWA members and retirees, including AFA-CWA members, stand in solidarity with thousands of Marriott workers who are on strike in Detroit, Boston, Hawaii, Oakland, San Diego, San Francisco, and San Jose to demand better pay and benefits. 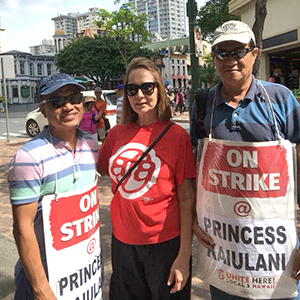 CWA members and retirees stand in solidarity with thousands of Marriott workers who are on strike in Detroit, Boston, Hawaii, Oakland, San Diego, San Francisco, and San Jose to demand better pay and benefits. The Marriott workers are sending a message to the company that nobody in America should have to work more than one full-time job to make ends meet, put food on the table, and build a better life. Find out which hotels are affected by clicking here, and join us in calling on Marriott, the largest hotel company in the world, to support workers in their fight for a better future. The AFL-CIO has launched a new podcast called "State of the Unions" to bring you the issues and stories that matter to working people! Episodes will drop every other Wednesday featuring interesting interviews with workers and allies across the country. Check out the introductory episode and subscribe on iTunes, Google Play, Stitcher, and anywhere else you can find podcasts.